Foodies beware, restaurateurs are on to us. They lure in the decent, honest gastronaut with interesting online menus and bigged-up Chef CVs (Worked with MPW = Chopped some carrots but got sacked the following week). You pitch up all expectant and excited and then realise, pretty quickly, that you’ve been sold a pup. It’s all the more galling when in these straightened times genuinely good and interesting places are suffering whilst the cruddy ones continue to divert valuable funds. I had two such experiences recently. One experience was of the “Look, I’m not angry – I’m just disappointed” sort. The other was of the laugh out loud, hilariously bad sort. The pain of writing about two different yet similarly depressing experiences is immense, but I’m going to tough it out for you, dear reader. I don’t know whether it was just the area of London I was visiting - High Street Ken - but looking for a pub for a pre-prandial pint before my visit to Bistrot Eleven proved problematical. I ended up at the only pub I knew, the Elephant and Castle, an old stamping ground of HS when he used to work for Penguin. It’s owned by a chain now so it was hardly surprising that I had to get my pint topped up and that in the end it wasn’t worth doing, so poor was the pint. 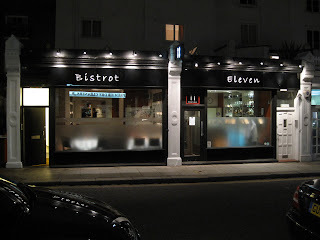 Bistrot Eleven - 11 Abingdon Road in its previous incarnation - promised much when I browsed the menu online: good-sounding combinations jumped out at me as I mentally put together my proto-meal. The reality was different. The dishes were mostly still there but they seemed to be missing the components that had attracted me to them in the first place. Where were the Kidneys ? The Sweetbreads ? The Truffled Macaroni ? My instincts about restaurants have become finely honed after many years of dining out but still I ignored the nagging inner voice which said just get the Steak and Chips and go. My fears were compounded when a neighbouring table received their food and the assembled diners immediately fell silent. I’m sure my face must have betrayed immense disappointment when the Goats Cheese Beignets arrived. I had expected something ethereally light and delicious. Instead , small breadcrumbed tubes, maybe of the Findus family (or should that be genus ? 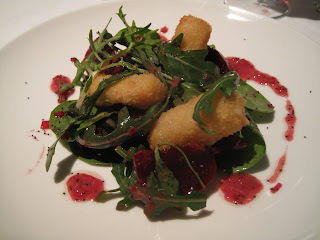 ), that tasted mostly of oil and very little of Goats Cheese came with some chunks of Beetroot and a bit of Rocket strewn here and there. It was at this moment I realised I’d made a mistake, but there was no backing out now - I’d ordered an extra starter. Twit. 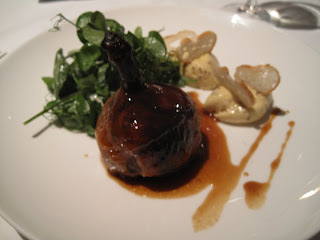 Confit Shoulder of Rabbit was a small ball of bunny meat which came in a rather nasty caul. The meat itself had been shredded and had a decent texture but had no depth of flavour, or, indeed any flavour at all. 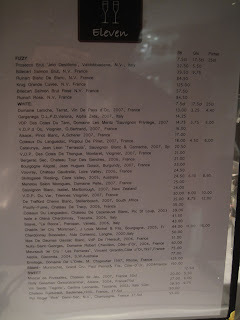 Likewise, the Pommery mustard mousseline accompaniment lacked bite or interest. Pea shoots, plonked on the side, seemed like an afterthought rather than a measured contribution to the whole. My main of Gilthead Bream at least proved that someone had the chops in the kitchen – the fish was cooked pretty well. Only problem was, it smelled. Of fish. Which is not a good thing. I also think there may have been a mix up with a delivery of a flatpack from Ikea as I’m sure my fish was topped with rubber washers and not the advertised Sautéed Baby Squid. 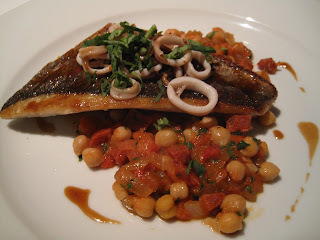 The mixture of Chickpeas and Chorizo the fish came on was dull bedsit-level cooking. 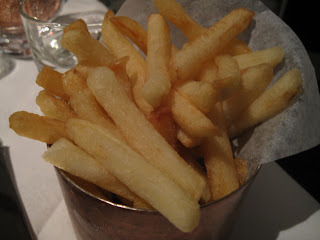 Chips weren’t too bad. 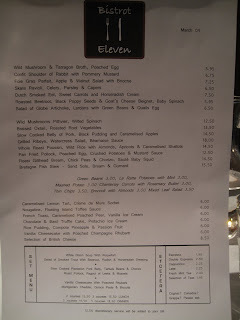 I get the feeling that there’s a capable kitchen at Bistrot Eleven but that it’s just not trying hard enough. There’s also an obvious skimping on the quality of the ingredients. Both these things are fixable – if the will is there. I’ve probably used this analogy before (and if I have, tough – it’s our blog) but going to a new restaurant is a bit like a first date. You start off all optimistic, excited and looking forward to the evening ahead. Things don’t get off to a good start and you know it’s not going to get any better. You struggle on for a bit, trying to maintain a smile. You pass on dessert and coffee. The bill is like a departing slap to the back of the head. Well that’s what my first dates are like. As I said before, not angry, just very, very disappointed. Sigh. 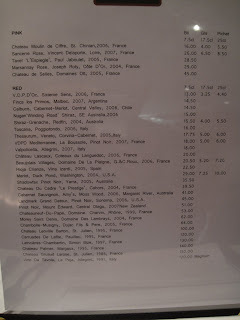 I also probably fall too much into the trap of being internet reliant when researching restaurants. Some places can look so good on paper (well actually on the screen) but then the reality is disappointing. You implied there were 2.If B11 was the disappointed one of the 2 experiences,which was the hilarious laugh out loud bad one? Thank you for not ordering the steak. You guys make the best steak yourselves-I have seen the pictures!So why do you set yourselves up for disappointment by mostly trying the steak when you go out?Yours is the best,so try something else that you don't excel at(at home) when you go out.